Gamru Rag Rugs: Honoured to be commissioned to make rugs for the nuns at Dongyu Gatsal Ling. 100% recycled fabric turned into beautiful rugs and an honest living for rural Indian women. Honoured to be commissioned to make rugs for the nuns at Dongyu Gatsal Ling. The ladies of Gamru Rag Rugs were honoured with a request to make rugs for the Dongyu Gatsal Ling (DGL) Nunnery located near Palampur, which is approximately an hours drive from Dharamsala. Winters in Himachal Pradesh are very cold, especially with no central heating installed. The rugs were commissioned for the use of the nuns in their rooms, to provide a welcome relief from the bitter cold of the bare floors. Gamru Rag Rugs`aim is to help improve the lives of less privileged local Indian ladies by utilising easily accessible waste products and turning them into beautiful rugs and wall hangings. Each lady owns their own rug, so to speak.They can keep it,sell it or give it away.When sold the individual rug makers receive 85% of the total sale of the rug.Customers pay for postage and packing.The other 15% is kept to pay for collection of materials, provision of basic tools, and towards the rental of space. All the ladies have benefited in many ways. They have developed a deep pride in their work-which is totally different to anything they`ve seen before. Self confidence has grown and they have learned a new skill, while also managing to supplement their meagre household incomes. This project is of a sustainable long term benefit to the local community..
Back RowLeft to right:Sonia, Indrahar, Nimmo, Shivani, Shivani`s friend. 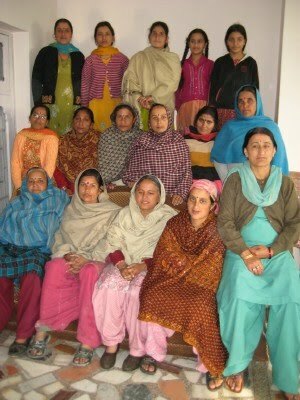 Middle Row Left to Right:Lalita, Meena, Shreasta, Beena, Sunita, Maya. Bottom Row Left to Right:Perkasi, Usha, Bindhra, Pappy, Subhadra.